New Delhi, Feb 7: “Teaching has to become a profession of choice, not a profession of leftovers,” said Union Minister Prakash Jawadekar while addressing two-day KVS and NVS National Principals’ Conference. He is speaking at Valedictory session of KVS and NVS National Principals’ Conference in New Delhi. 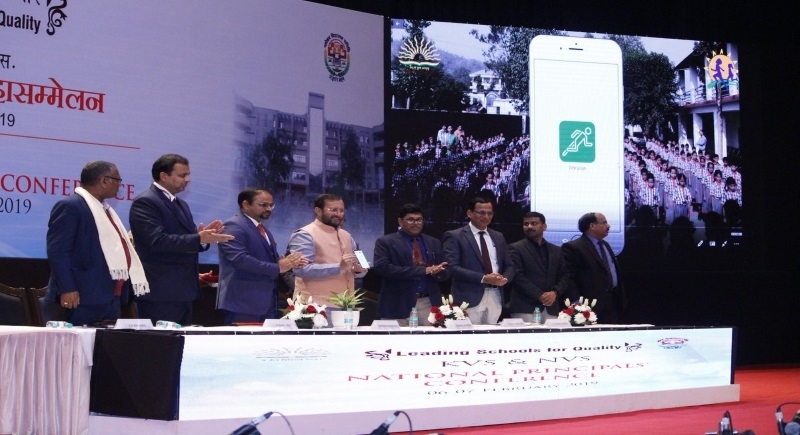 On this occasion, Union Minister Prakash Jawadekar launched Mobile app named ‘FitKVian’ which is part of KVS initiative “Swasth Bacchae, Swasth Bharat”, to prepare comprehensive and inclusive physical health cards for 12 lakh students of KV. This initiative launched by Union Minister Jawadekar on 21 August 2017. This ‘FitKVian’ app and web portal will facilitate the fitness assessment of 12.5 lakh students across the country. This web platform will provide dashboards to access schools, KVS Headquarters and parents. It will also provide fitness report cards to students and analysists and monitoring platform for KVs with the key objective of to create baseline points for developing national fitness index. Two-day national conference of principals of KVs and NVS began from February 6. One thousand and 800 principals of these schools are participating in the conference. Inaugurating the conference, Joint Secretary in the Ministry of Human Resources Development R C Meena said, the Ministry has taken several steps to enhance the quality of education. Mr Meena said, the Ministry had signed an agreement for India’s Participation in Programme for International Student Assessment- PISA 2021. this will lead to improvement in the learning levels of the children and enhance the quality of education in the country.